My friend shot videos with the new Panasonic Lumix DMC-ZS7. After downloading the AVCHD Lite .mts videos to iMovie 8 and exporting as .mov, the video is 2x speed faster than the audio in normal speed. QuickTime Player does not support the 720p MTS, and the VLC media player does not recognize the .mts files from built-in memory of the camera. The free to try method is to update VLC to see if it works for the DMC-ZS7 AVCHD Lite 720p MTS videos then. Another solution is to convert AVCHD Lite to MOV with third party software with perfect synchronization. If you have just purchased Lumix DMC-ZS7 digital camera, and have difficulties playing the recorded AVCHD Lite files on iMac, Aunsoft Video Converter for Mac is the recommended Panasonic video converter on Mac OS X 10.4 Tiger, 10.5 Leopard and 10.6 Snow Leopard. 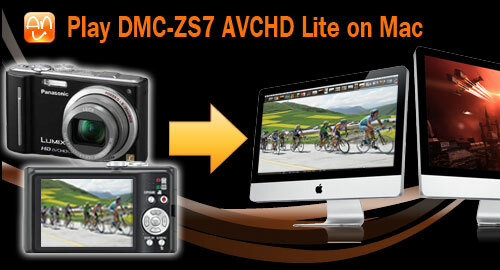 Follow the simple steps below to play AVCHD Lite videos on Mac in HD 720p. Step 1. Load AVCHD Lite videos to Aunsoft Video Converter for Mac. Connect Lumix DMC-ZS7 to iMac and transfer .mts files from camera SD Memory Card, SDHC Memory Card, or SDXC Memory Card to Apple hard drive. Run Aunsoft Video Converter for Mac as the perfect Mac Panasonic DMC-ZS7 video converter, and click the "Add" button to load .mts videos for conversion. Click the "Format" option, and choose Common Video > MOV - QuickTime(*.mov) as output format. The Mac Panasonic video converter will transcode AVCHD Lite MTS to MOV, keeping the original video resolution 720p. Step 3. 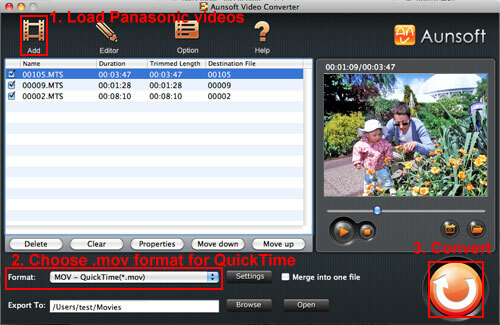 Convert Panasonic DMC-ZS7 video to MOV for QuickTime. Click the convert button under the preview window, and the conversion from AVCHD Lite MTS to MOV for QuickTime Player starts right away. After the conversion, the output videos shall play on QuickTime without video and audio synchronization issue, and the output videos could be imported to iMovie, Final Cut Pro (FCP) and FCE4 for editing, and iDVD for burning to DVD. The Mac Panasonic video converter also works with videos from other Panasonic camcorders like DMC-ZS3, HDC-TM350, HDC-TM700, HDC-HS700, HDC-HS250, HDC-SD60. TiVo videos, MKV video could also be imported for conversion as you like.